I started this one on a whim and quite surprised myself - it was another 250 pages before I forced myself to put it down again! 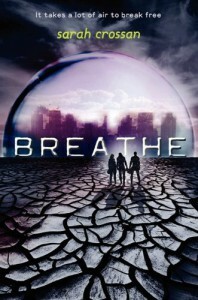 Breathe has a very addictive plot, is really fast paced and could easily become one of my favourite Dystopian series. It's told from the perspective of three different characters - Bea, Quinn and Alina, all with very different perspectives on life. I found myself drawn to Bea, as Alina came across as a bit stuck up at first and Quinn's infatuation with everyone else but Bea and then later events irritated me! I loved all of the action, too. Sarah doesn't waste much time laying the story out which I appreciated, however I was a bit unhappy to discover the second book is about the characters trekking across the land a lot. It's not exactly an original idea, is it?